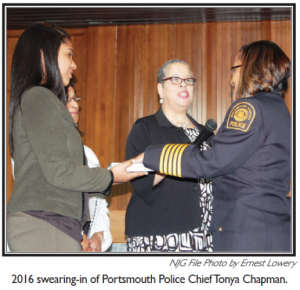 “I can assure you that I did not quit on the citizens of Portsmouth,” Tonya Chapman said in a letter she released to the media on Monday, March 25, one week after suddenly resigning from her nearly three years as Portsmouth’s Top Cop. That statement from Chapman along with Chapman’s charge that the Portsmouth Police Department is biased have raised the ire of the Portsmouth community about why the city’s first African American woman police chief was suddenly released from her position by City Manager Dr. L. Pettis Patton. Resistance from an entrenched and racist cadre of police officers who resented her efforts to diversify the department played a significant role in Chapman’s being forced to resign as Portsmouth’s Police Chief, according to Chapman’s letter. But Chapman noted that the most “heart wrenching” and surprising part of the scenario related to her exodus were the actions of City Manager Dr. L. Pettis Patton, with whom she had established a very professional and warm relationship. She said prior to her recent vacation, she and the City Manager had a very warm exchange. While on vacation, she received a message from the City Manager requesting that Chapman meet with her upon returning home. The former chief said she then sought to contact Patton, to no avail, which she found usual. Chapman said she asked the City Manager for specifics on why it had occurred and noted the attempted vote of “no confidence” from members of her department. “She then continued reading and then asked for my resignation,” said Chapman in her letter. Chapman said she continued to insist on additional information but was given nothing else. Chapman said she had not been counseled or warned on any issues. “She then stated that if I did not sign the pre-written letter of resignation, she would terminate me,” said Chapman, who said she could not believe the action was taking place. On the evening of the letter’s release at 6 p.m., the Portsmouth NAACP, members of the National Organization of Black Law Enforcement Executives and irate residents stood in front of the Confederate monument in downtown Portsmouth to show support for Chapman and denounce how she was treated. James Boyd, the President of the Portsmouth Chapter of the NAACP, said the staging of this event at the foot of the Confederate monument symbolized the racist nature of the city’s political tension now. In her three-page letter, Chapman outlined what she said were the factors which led to her surprise exodus on March 18 as the first African American female police chief of a major Virginia city which is majority Black. Chapman released the letter a week after she stood next to the City Manager of Portsmouth Dr. L. Pettis Patton and announced her resignation, with neither one of them giving a definitive reason. Questions for why Chapman resigned with no explanation, had been asked by the public and the media since March 18, with various scenarios produced. But in her letter, Chapman provided some specific examples of the antagonists who were key players in events leading up to her exodus. She noted that the crux of her resistance was the indigenous racial climate and tension with members of the Fraternal Order of Police (FOP) which is mostly white. She mentioned that the resistance to her command were fostered by the FOP members who were disciplined for violations of policy. She also suggested this resistance was powered by the inability of the group’s mostly white and male membership to accept commands from a Black female. She said the organization had “tried to generate a vote of no confidence on me for the past two-plus years without success as they have not been able to articulate valid reasons” for doing so. In her three-page letter, Chapman delivered a timeline which reflected the most positive aspect of her 2.5-year tenure and the most disturbing. Chapman opened her letter describing the excitement in the community and the pride “in the eyes of family members, coworkers, friends, and state officials” created by her being named the first Black female police chief in Hampton Roads. 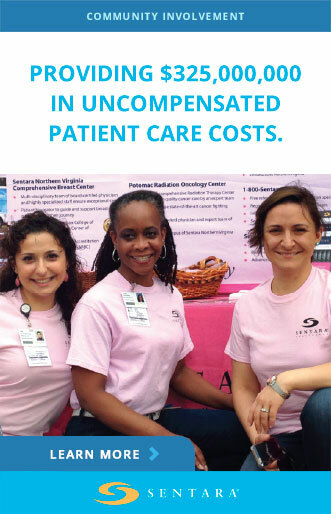 Chapman said despite the caveats, she was not deterred from assuming her new job and role. Rankin, a white policeman, shot and killed 18-year-old William Chapman II. The incident took place outside a Walmart when the 18-year-old Chapman was accused of shoplifting. The officer claimed that Chapman, when confronted, had knocked away the officer’s stun gun and then charged at him causing him to kill him. A circuit court jury found Rankin guilty for the killing of William Chapman in April 2016. It was the second time Rankin had killed an unarmed man while on duty. He now faces up to 10 years in prison. “…..(T)he internal strife included racial tension within the police department (that) became blatantly apparent to me,” upon her arrival to assume command of the department, Chapman said. She said she was determined to change the culture. “I am elated to report that most officers embraced that same spirit. The result was a 52 percent reduction in homicides during her first year of 2016; reduction of crime by 7 percent in 2017 and an 8 percent in overall major crimes. Women and minority representation increased from 36 to 46 percent within two years; minority presence increased to 31. The department recruited over 50 recruits within one year, which consisted of 74 percent women and minorities in 2018. Chapman launched other “community policing efforts including “walk and talk, teens and traffic stop program, faith behind the badge coalitions and the Rapid Engagements of Support in the Event of Trauma of RESET walks. Whitaker said that he sought to address many of the issues that Chapman was working on when he was on council. Next article Women are Stepping Up!